Today we head back west on our journey to the Pacific coast. 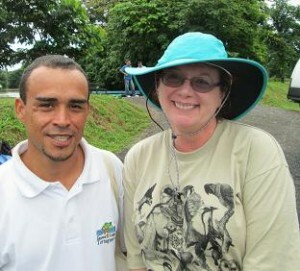 Before we leave the Caribbean coast, however, CVH befriends a cat and gets her picture taken with the jungle guide. Somewhere José got hold of a poison frog, called a Blue Jean frog because the lower half of its body is a bright blue color, making it look like it is wearing blue jeans. He brought it onto the bus for us to take pictures. When we stopped for lunch, we were once again treated to an interpretive dance. 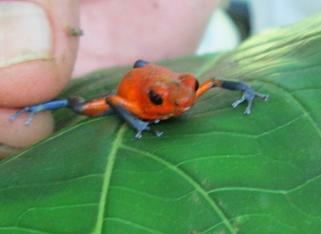 This time it was a paean to the fauna of Costa Rica. The young woman who played the jaguar was really good. 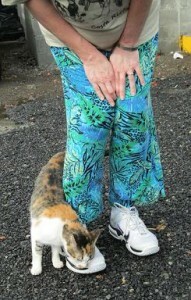 You could tell that she had studied cat movements. Julie Newmar had nothing on this lady. After lunch, it was more pineapples. 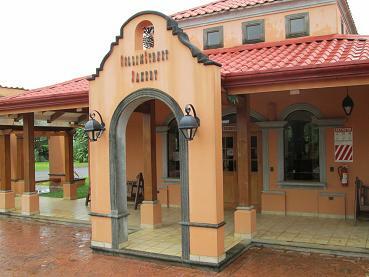 We visited just about the last thing I expected to see in rural Costa Rica – the Alamo-themed Collin Street Bakery building. Yes, we’re a long way from Corsicana, but this is where their pineapples are grown. They even have a Texas flag flying out front (of course!). 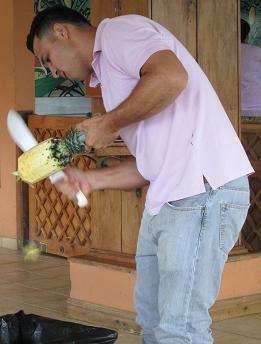 Here we see a man trimming a fresh pineapple with a very sharp knife. I only wish I could have stayed around to watch him sharpening it. The knife, that is, not the pineapple, which he passed around for us to eat.